Equities start the day lower as bulls become scarce. I don’t know, that might be a pretty controversial statement to make, let’s rephrase it to “retail investor bullishness becomes scarce.” AAII surveys come out on Thursdays and today’s showed only 20% bulls. Not only that, the ratio of bulls to bears is at a level we haven’t seen in in years. So what big conclusion can we draw from this one data point? Well, if we are being responsible about our commentary we would say none given it’s just one factoid, but if we are using it as part of a broader view it could have some relevance. The bear case is valuation and an overloved / overbelieved market that is bordering on a bubble right? So when we see something like the AAII survey we have to ask ourselves one question: “would sentiment surveys in an overloved bubblicious market look like this?” I would argue no but that’s just my opinion and you may disagree with it. Which is fair, disagreements are what makes a market. Now as you know, I’m a huge fan of sentiment measures so when I see something like this I tend to feel better about my market view. Now I’m not advocating an “all clear” bell to go load up on margin I’m just saying that it doesn’t feel like this puppy is about to come to a crashing end. I guess the sideways grind will continue because sentiment isn’t overly bullish yet we have no real catalyst to go higher. 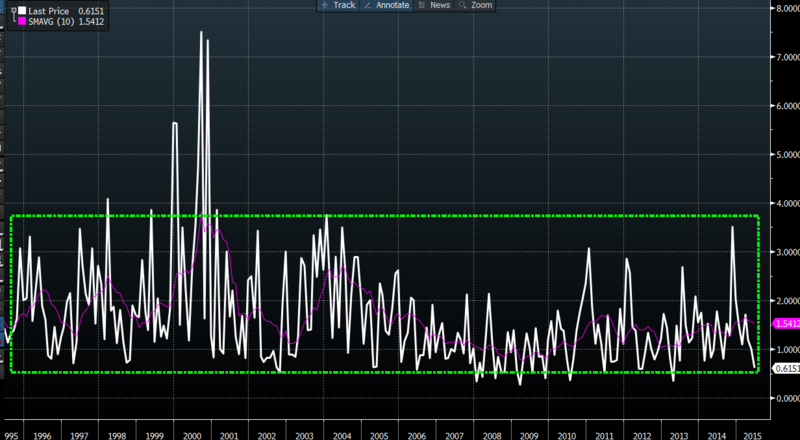 Will the tightest range in 20 years continue? I think so my friends, I can’t point to a multitude of factors that argues for either direction. There’s just so much conflicting data that it doesn’t surprise me how boring the market has become. Wait for the Fed, wait for Greece, wait for earnings, wait for speeches, wait for data, wait to see if Danerys gets off her dragon and helps the people she left behind (I mean how screwed were they?). After the open it looked like we were going to have a bit of follow thru from yesterday’s stampede. 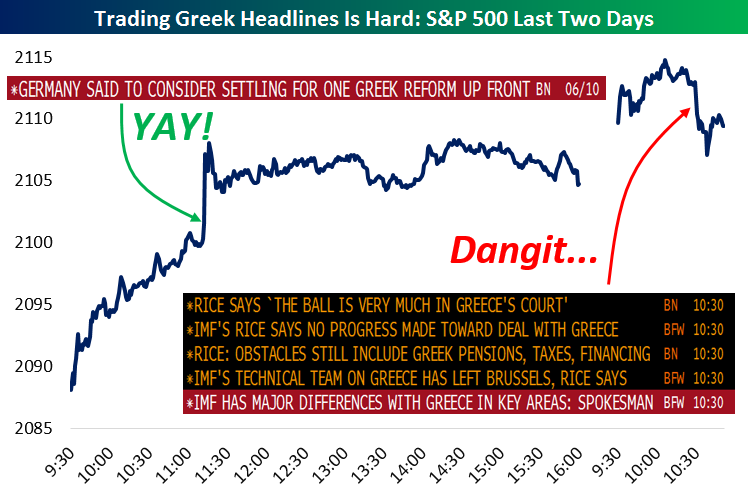 Unfortunately we got a negative Greece headline and that dropped us right back to unchanged. Sigh. Bespoke did a great job on Twitter pointing out how ridiculously hard it is to trade headlines so yea, fun times abound. Retail sales were out this morning and they actually beat! USA USA USA. In fact, take a look at the Atlanta Fed’s GDPNOW series that puppy is back near 2%! Call off the recession forecast my friends because it looks like the Great Thaw may have actually happened (I’m doing my part). After that little Greece selloff we spent the next 4 hours going sideways because that’s what the S&P loves to do nowadays. What else. LULU dropped 1% because the Founder is selling 20 million shares! Wow. Energy names fell because Crude oil was down and Offshore Drillers got drilled because Barclays had a piece saying “The worst has yet to pass.” Lovely. KKD was a big winner though (+13%)! Who doesn’t like to see the Donut trade do well, that’s just good ole fashioned sugary heaven! By lunch we sat on 2,110, up 0.25% going completely bonkers over the quiet-ed-ness. That’s not a word but I’m going with it so deal. And hoo boy is it apropos. Absent the first hour of the day we spent the entire session in a 3 pt range. Hello, is anyone out there? Is this thing on? Man it’s hard to write about a market that’s in a 6 month range. God bless Financial Journalists because this really must be taxing their creative writing skills. The market went nowhere today because nothing happened. The market went sideways today because sideways is the new up. The market refused to either rally or selloff because Janet Yellen is on vacation in Ibiza (where do we think she really goes? I’ll guess Martha’s Vineyard or Maine. Somewhere she can get away from it all). Anyway we closed at 2,109 which was basically unchanged. I’m sure Friday will bring ALL sorts of crazy volatility so stay tuned for a new low in dispersion (what an awesome fancy term, I need to use that one more). Final Score: Dow +22bps, S&P500 +18bps, Nasdaq +11bps, Rus2k +16bps. Well, when things go nowhere the news gets really boring so let’s move to the big finish. Tonight we’re going to look at a cringe worthy video. This is either the luckiest man in the world or the stupidest man in the world. We almost had the Darwin Award winner here people!